The widespread and decades-old practice of fluoridation — roughly three-fourths of Americans live in communities with fluoridated water supplies — is a federally recognized public health policy meant to curb tooth decay. But the strategy has courted increasingly vocal resistance in recent decades as some new scientific evidence indicates marginal benefits or even adverse human health impacts. Tap water in Buda had been fluoridated for years until residents in the neighboring city of San Marcos voted in 2015 to ban the practice. Buda — located in one of the fastest-growing counties in the U.S. — receives the majority of its water from San Marcos' municipal water plant. The Buda City Council almost immediately sought to reintroduce the mineral additive to the city's water supply with technical and financial assistance from a state fluoridation program. They began installing all the necessary equipment at the end of 2016. But earlier this year a group of citizens rallied against the policy, arguing that added fluoride could be harmful and even toxic to consume even though it meets standards set by the American Water Works Association and the National Sanitation Foundation. 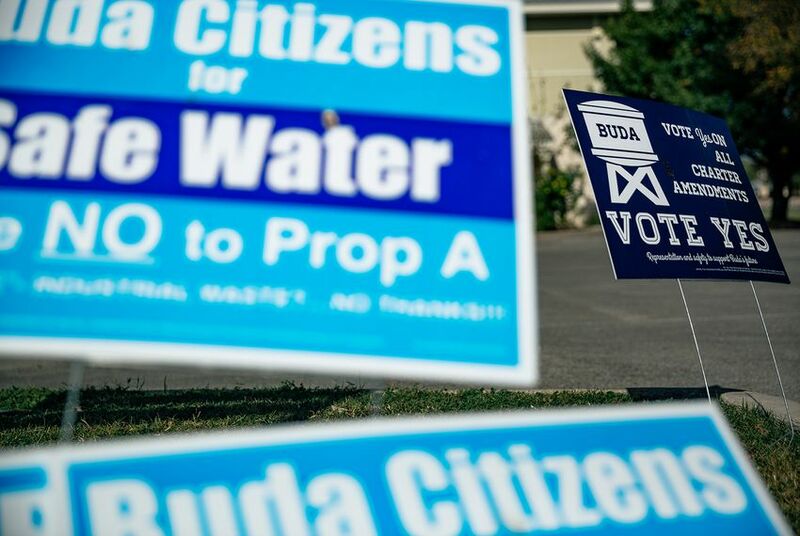 "There's not a good reason to put it in the water," said Michael Meuth, a Buda resident and member of Buda Citizens for Safe Water. He said he decided to stop drinking Buda's tap water several years ago after he researched the issue and decided that it could cause kidney, bone and thyroid problems. He said the naturally occurring fluoride in the water is enough. In general, fluoride is found in trace amounts in surface water sources such as rivers but falls below what the federal government considers the optimal level to prevent cavities — .7 milligrams per liter. The U.S. Department of Health and Human Services, as well as countless dental associations, say boosting fluoride levels in tap water is a cost-effective, safe and beneficial method to ward off tooth decay, particularly for low-income populations who may not have access to dental care. U.S. cities and water authorities have been adding fluoride to drinking water for more than 70 years, according to the Centers for Disease Control. As of 2014, nearly 75 percent of Americans lived in communities with fluoridated water supplies. The share of Texans who lived in communities with fluoridated water supplies that year was higher than the national average — about 80 percent — but the percentage has dropped several points in the past three years as some cities have ceased the practice, according to a spokesman for the Texas Department of State Health Services, which runs the Texas Fluoridation Program. The number of water systems in Texas that boost fluoride levels in their drinking water systems is down to 118 from nearly 200 almost four decades ago, said Chris Van Deusen. That's one reason why Evan Ture, who is running for a Buda City Council seat unopposed, said he doesn't support the practice. "I don’t see it as a necessary cost to the city," Ture said. "There are others things affecting our ability to prevent dental carries other than fluoridating our water." The design and installation of Buda's proposed fluoridation system would cost nearly $52,000, according to a city report. (The state has already agreed to pay for the vast majority of it.) And a two-year supply of fluoride would cost about $9,000. "They don’t understand the health care benefits of what they're taking away," he said of cities that have dropped the practice. "What we know as dentists is water fluoridation is the cheapest, most effective way to control dental [cavities] that is out there." Recent studies casting doubt on the benefits of fluoridation are "junk science," he said. "We want to be able to provide information so people can make a decision without fear or misinformation," she said. Correction: A previous version of this story gave incorrect information about what the federal government considers to be the optimal level of fluoride in water to prevent cavities and about the percentage of Americans and Texans who drink fluoridated water. A previous version of this story also incorrectly stated that the federal government and dental associations say that the addition of fluoride to tap water is the most cost-effective, safe and beneficial method to ward off tooth decay. They say it is just a cost-effective, safe and beneficial method.